YuppTV Blog: Bigg Boss Finale: Why this season of the reality show become the most talked about show? Bigg Boss Finale: Why this season of the reality show become the most talked about show? Bigg Boss: The most controversial and the most watched Indian Reality show, hosted by Salman Khan has reached its finale which is going to be aired on 14th January 2018 on Colors TV and Colors TV Live. The show whose theatrics are well known to the audience of entire India still ranks the top among the reality shows. Bigg Boss show has always been controversial and has been pushing the limits of Indian audience sensibilities a bit further with its every season. The base personalities of human beings and elements like PDA, harassment etc., which most of the Indian audience do not agree with in Films or other Television shows were eerily accepted by the audience in this show which led it to its present position of fame. More than any previous seasons this year’s season displayed an outrageous amount of these behaviors. Some elements like Arshi Khan explaining how she enjoyed applying butter on Hiten Tejwani’s body, or how everyone calmed down Akash Dadlani when he complained about Arshi slapping him on the backside, or Akash’s joke suggesting Shilpa Shinde to apply lotion on her private parts, constitute only some among the many happened. And surprisingly these happenings did not receive much public outcry. But the show is among the most talked because of some issues like Hina Khan’s comment about South Indian actresses being overweight and about other Bollywood actresses. It became a hot topic on the internet in some instances where a popular celebrity from in the house cried because of the harassment. Another instance of a live voting activity where fans misbehaved with Hina Khan also made it to the news. In all likelihood the show definitely made the Indian audience confused about the topics of Harassment, jokes, and obscenity and made them accept these elements as common human behavior. But Serious issues apart, the show is one of the top-rated ones on Indian television and garnered many fans in the overseas as well. And the show has reduced to 4 final contestants from a starting number of 13. 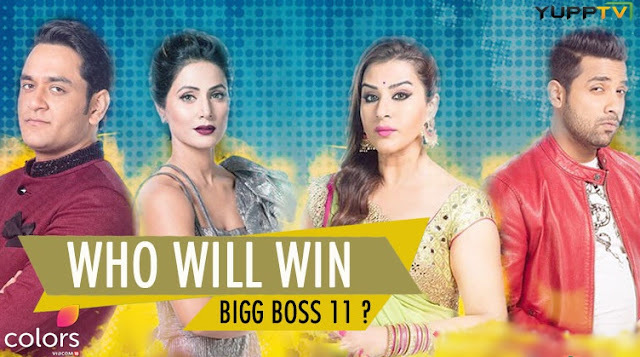 The 4 contestants who made it to the final this season are Hina Khan, Shilpa Shinde, Puneesh Sharma and Vikas Gupta.